It has been nearly a month since the Chase Marriott Visa card exited our market but that doesn't mean Marriott Rewards members lose out on earning points in their favourite hotel program for everyday purchases. How so you may ask? How will I be able to earn points outside of Marriott stays? Well the answer to that is the Starwood Preferred Guest Credit Card from American Express. And for those of you who did have the Chase Marriott Visa you have one week left to get in on this exclusive offer for you for the Starwood Preferred Guest Credit Card. If you have been collecting Marriott Rewards points and the program is your hotel program of choice then you should already know that Marriott owns Starwood and that you can link and convert points between the loyalty programs of both chains. This means you can use the Starwood Preferred Guest Credit Card from American Express to actually earn Marriott Rewards points. How so? The American Express card will earn Starpoints for your purchases and then you can link your Starwood Preferred Guest account with your Marriott Rewards account. Once you do this you can convert the SPG Starpoints to Marriott Rewards points at a rate of 1 to 3. That's right you are technically earning three Marriott Rewards points for every one Starpoint earned on the credit card. So what should I do if I have the Chase Marriott Premier Visa Card? The good news is if you have the Chase Marriott Visa card, American Express has come out with an exclusive offer for you for the Starwood Preferred Guest Credit Card as long as you have not had it before. The offer sees the sign up bonus boosted by 5,000 Starpoints to 25,000 Starpoints (non-Marriott cardholders are offered 20,000 Starpoints) after meeting the minimum required spend on the card as well as a 8.99% balance transfer for the first 12 months, the latter of which I guess makes sense for anyone who has been carrying a balance on their Marriott Visa card. Starpoints, the currency of Starwood Preferred Guest is one of the most valuable loyalty currencies on the market today and that extra 5,000 points is a sweet deal, adding at least $150 in value to the card. As we mentioned already, Starpoints easily convert to Marriott Rewards points, all you have to do is link your Marriott Rewards and Starwood Preferred Guest accounts and then the transfers are easy. One Starpoint is worth three Marriott Rewards Points. What does that mean with the SPG Credit Card? That means the sign up bonus is equivalent to 75,000 Marriott Rewards points, the standard earn of 1 Starpoint per dollar spent is equal to 3 Marriott Rewards points and the 2 Starpoints per dollar spent at participating Marriott and Starwood Hotels is worth 6 Marriott Rewards points. The last offer of spend at their hotels has now been extended to July 31 from the previous end date of February 15. You can search all Marriott Hotels and their respective category placements here. 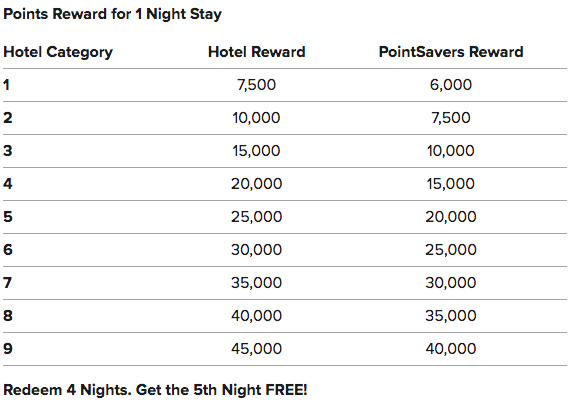 Of course you don't have to convert to Marriott Rewards right away, you can store the points in your SPG account for use at Starwood Hotels which once again, the sign up bonus of 25,000 Starpoints provides some huge value! This offer is only available to existing Marriott Rewards Visa Credit cardholders who do not already have the SPG card. • Receive 25,000 Starpoints after you spend $1500 CAD in the first three months after opening their account.